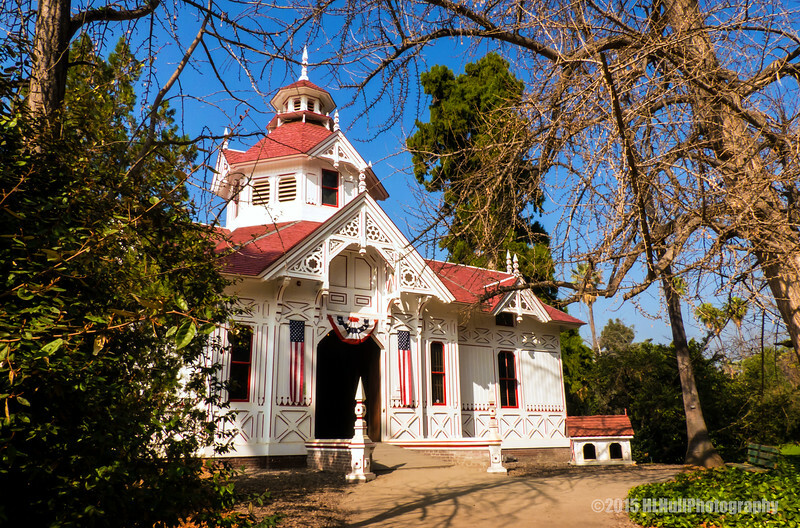 Designed by architect Albert A. Bennett, as was the Queen Anne Cottage, the Baldwin Coach Barn is an equally ornate example of Victorian extravagance. Alternating slats of interior cedar and redwood paneling and original iron grillwork, cast by Savage and Son of San Francisco in 1879, contribute to the feeling of opulence. Lucky Baldwin housed his private carriages plus those of his guests in this Barn (a report of 1891 indicated 14 different vehicles in residence). Generous stall space was provided for carriage horses, and convenient hay and grain chutes were fed directly from the loft above. Coachman’s quarters, originally provided in the upper tower room above the hay loft, have been re-created in the downstairs tack room. Best looking barn I've seen. Definitely in the 'if you've got it, flaunt it' genre of structures. I've seen the Queen Anne Cottage at the LA Arboretum many times. but not the coach barn. Will have to find and explore it next time. Lovely capture of this vintage home! Lovely cottage...really like the paint job! Beautiful find, comp and capture. What a beautiful building, and great information too! To have had 14 different vehicles in 1891 is pretty amazing. Very well captured and thanks for the information, as well!